Question: Do you do anything differently when you know you’re fly-fishing for stocked trout? 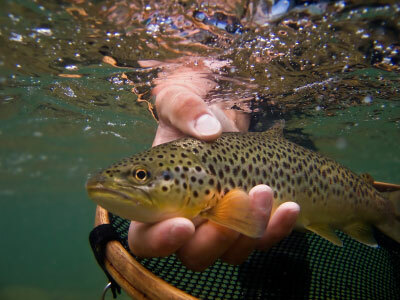 Answer: Fly fishermen tend to scoff at hatchery-raised trout as somehow less noble or worthy than their wild counterparts, but the fact of the matter is that the vast majority of trout fishing in the U.S. outside the Rockies involves stocking of some kind. Sometimes the hatchery truck pulls up to a boat ramp and disgorges a few hundred discombobulated trout that are more or less immediately caught and killed. In other places, trout are “float stocked,” a process in which each trout is placed in suitable habitat in a stretch of river. Some states stock only during the closed season, while others plant fish all year long. The point is, there are all kinds of stocked-trout angling situations, and some of them call for more skill than others. Steve Hemkens, a product developer for Orvis, grew up fishing the trout parks of Missouri, where trout are restocked every day. The fish are under an incredible amount of angling pressure, and the water is often crystal clear. He offers these tips. Another good tactic is stripping flashy versions of the Woolly Bugger, such as a Beadhead Krystal Bugger, through the current. Good colors include olive, black, and white, in sizes 6 through 10. It doesn’t take that long for stocked trout to start acting more like their wild counterparts, and the hatchery fish soon learn to respond to more natural presentations. In these situations, it’s hard to beat a Copper John or a small Glo-Bug dead-drifted under an indicator.